With all that to-and-fro and ebb-and-flow, the motions of the ocean offer an endless supply of renewable energy. Or they would, if engineers could figure out how to capture that power. Most prototypes for wave-energy converters have been massive and costly, or else they're torn apart during violent storms at sea. 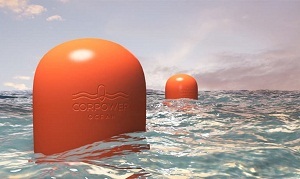 But a Swedish company called CorPower Ocean may finally have a solution. Tests show its new buoy can produce three times as much electricity as the best rival tech, with a far more practical design. For starters, it's relatively small: Whereas other devices can stretch hundreds of feet across and weigh will over a thousand tons, CorPower's bobbing red machine is a mere 26 feet in diameter. Yet a single buoy stationed offshore can generate about 250 kilowatts of power - enough to cover the electricity needs of 200 homes. Wave-power farms could contain hundreds or even thousands of them. The process relies on three key components: a mooring line that holds the buoy in place and keeps it upright and stable; a device called the WaveSpring that causes the buoy to oscillate in time with incoming waves; and a gear mechanism that converts that bobbing motion into electricity with maximum efficiency. The company's engineers have tested the wave-energy converters in tanks, and field trials are scheduled for next year. "CorPower could be the real winner in wave energy," says Antonio Sarmento, an independent reseacher in the field. "Their technology represens a breakthrough." More like a sea change.